You probably didn't notice, but a minor revolution took place in British journalism yesterday. 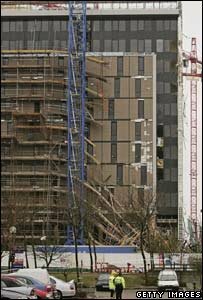 The story at the centre of the storm was mediocre to say the least -- the collapse of 14 stories of scaffolding in Milton Keynes. What was revolutionary was the way the audience responded to the event. Within minutes of the collapse, the BBC had received some 600 photos e-mailed by eye-witnesses. Some were put on air immediately, long before the "real" reporters and satellite trucks arrived. Other people e-mailed eyewitness accounts, together with contact details which were followed up when reporters arrived on the scene. The user-generated content flooding in drove the newsgathering operation, with the work of citizen and "professional" journalists seamlessly complementing one another. It was a glimpse of the future. No, not a glimpse of the future, just a temporary blink. Eventually, when the novelty of getting your picture “on the telly” wears off, the “citizens” will start to realise that they are getting ripped off by giving away for free all rights to their pictures and video. It's telling that the photo used to illustrate this is labelled "Getty Images". Commentor Stuart, your cynical prediction may hold true for some segment of the population. But believe it or not, there are many of us share information for the sheer purpose of sharing information. Also, consider that in any metropolitan area, an event like this is going to have so many mobile photojournalists snapping away that there will always be a surplus of availability. Set your price if you must, but don't be surprised when no one buys. I liked the raw feel of some of these to the official Getty picture. However, pictures by experienced photo journalists are certainly still needed in many situations. In addition, Stuart -- I have to agree with the annonymous commenter. There is a considerable population who would rather share information and ideas. Such things shared gain more value than such things locked behind rights management. There are some things that *ought* to be compensated. Images caught by accident via camera phone, digital camera are not one of those things. The money is not so much in the content in these cases; it is in the service, integration and/or presentation. If I’m being cynical then you’ll all being naïve ;-) It’s not so much the showing on your local or main news, it’s the fact that you are giving away all rights on your photo or your clip in perpetuity to the broadcaster who can use them commercially. Broadcasters are touting for free material, which may only initially be used as the donator intended. This is hardly different from companies (that “Watchdog”, and similar programs, all get hot under the collar about) collecting clothing, bedding, furniture, etc, etc which they claim is to be used for the disadvantaged and needy when in fact they are selling the items and only passing on a percentage of the income to the named charities. I happen to think that is morally wrong. I believe that the terms and conditions on freely given material should either time limit the transfer of rights or limit any commercial exploitation of that material. This will become more and more of an issue as technology improves and the quality of mobile phone video and stills approaches commercial material. There will always be a great number of people who just get pleasure out of sharing both images and written material, but I also think it's ethically wrong for companies to play on this sentiments and then turn around and sell that material they were handed freely and demand a price and copyrights over it.